Hello to all of the followers of Before the Clock Strikes Midnight! I'm happy to be guest posting on Tiffany's blog today. I'm Julie and I blog at Home Is Where The Heart Is. Each day of the week I blog about a different category. On Wednesdays, I blog about anything about children and parenting. Whenever my husband and I get out of the house with our two girls, Katie and Sophia, we love going to Barnes & Noble. They love going there for two reasons: treat (cupcake or cookie) and the train table in the children's area. Do your kids love playing at the train table at B&N? We got a train table for our own house when Katie was little from her Grandma and Grandpa. The train table is about half the size of the table at Barnes & Noble. The size is perfect for our girls' room. 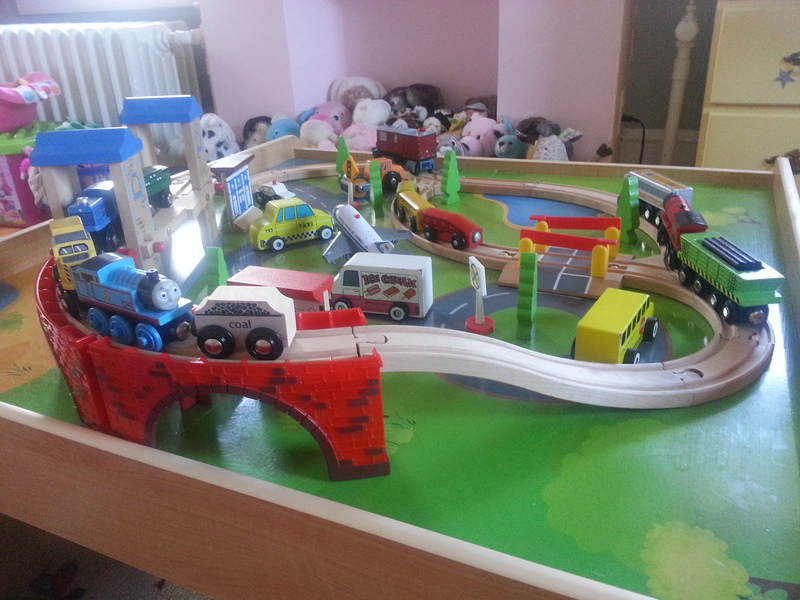 The train table is placed in the middle of their room. 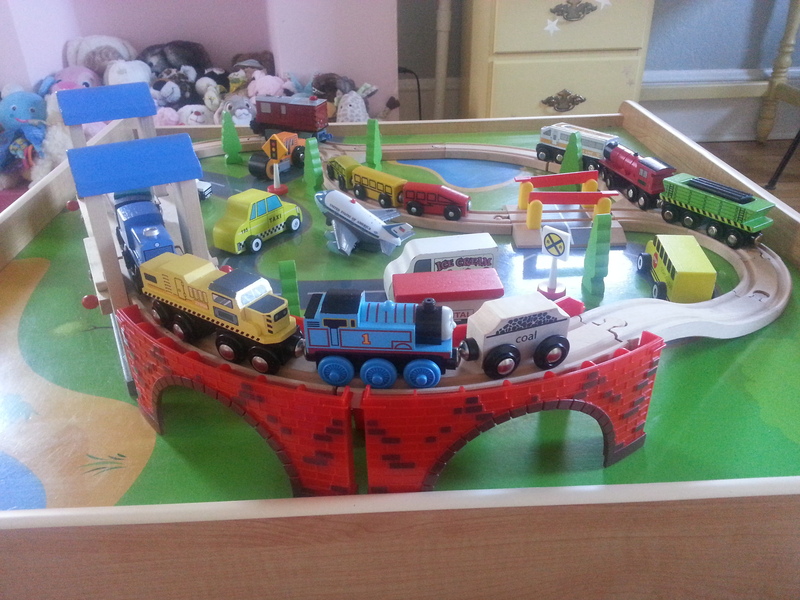 My girls love playing with this train table. This is what the table looks like when no one as touched it. 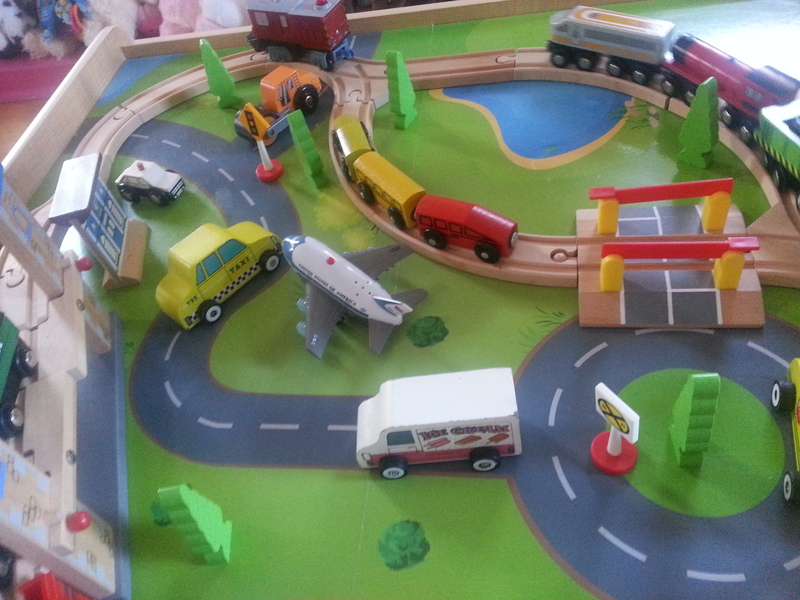 Katie loves to pull the trains across the tracks and loves to play with the cars on the roads. Sophia especially loves to take the tracks apart. Katie is then concerned that I have to 'fix the trains.' I couldn't count how many times I've put this train track back together and stage all the trains and cars. 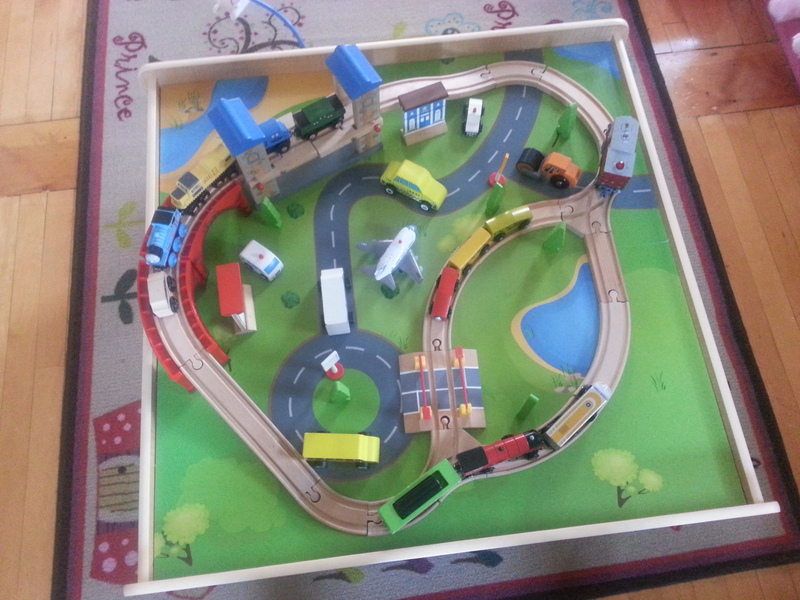 We slowly add new pieces to this train table. All the pieces are mostly generic trains and cars. The pieces that aren't generic are the Thomas train, Chuggington train, and Air Force One airplane. The blue bridge was added to the original set. 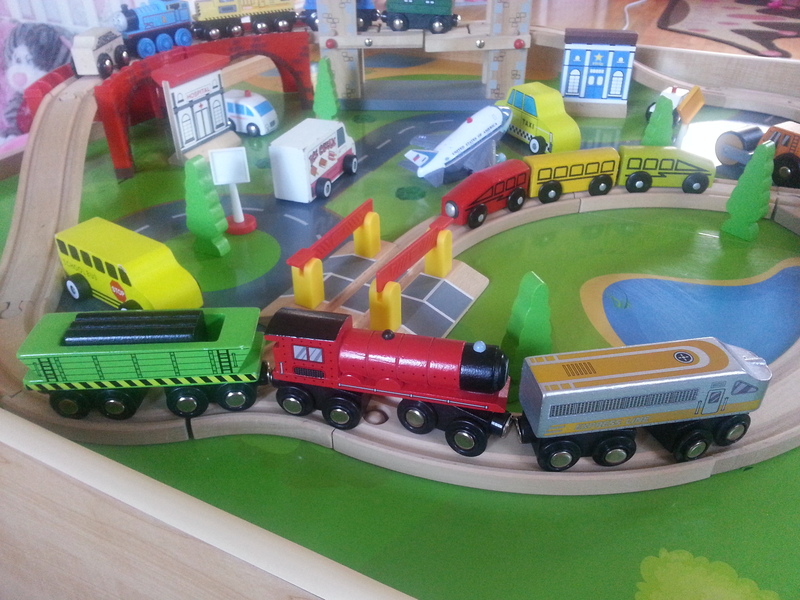 The red, yellow, and green train set is from Ikea. Some of the other places we find new pieces are at the Dollar Store and Target. 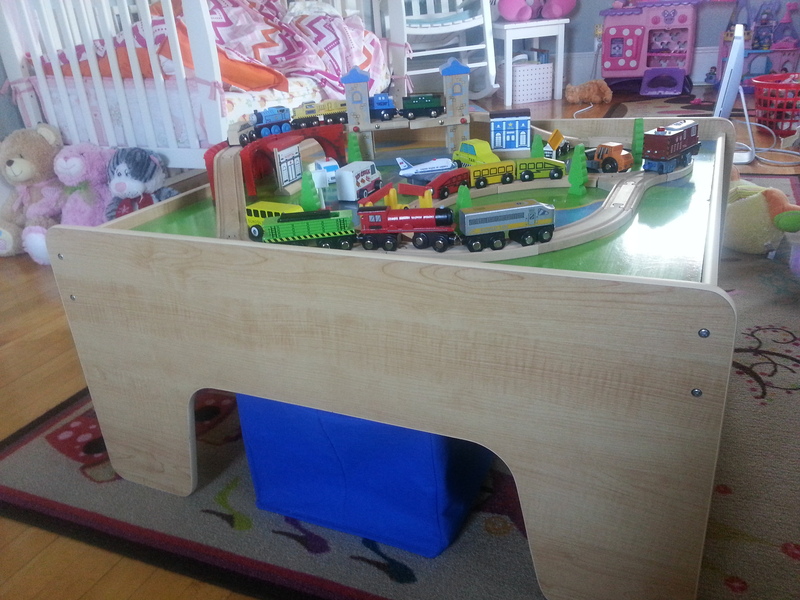 What do you think of the train table in my girls' room? If your kids love the train table at Barnes & Noble, they'd love this table. Come visit me at my blog at Home Is Where The Heart Is. I'd love to hear from you and get to know you! Thanks for reading. I'm so glad Julie was able to stop on over today! If you loved this post check out her adorable post on her yellow desk. Julie has great ideas for decor! My daughter ADORES trains, planes, cars, trucks, firetrucks...basically anything with an engine! She would be so enthralled by something like this. I'll have to talk my husband into something like this for Christmas!